The Azores high has proven to be a road block for Barcelona World Race leaders Bernard Stamm and Jean Le Cam. Their passage north saw them running out of breeze and so their tack eastwards, towards the Straits of Gibraltar, was only made early this morning. 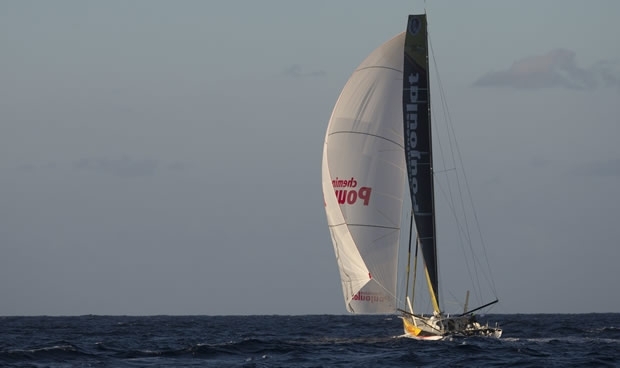 As Cheminées Poujoulat progresses east towards the Moroccan coast, passing south of Madeira, she will reconnect with the better northeasterly trade winds. The Swiss-French crew has 1100 miles to sail until the welcome of the Pillars of Hercules. Stamm and le Cam are due to pass back into the Mediterranean on the evening of Sunday 22 March. But then it will remain upwind all the way to the Moroccan coast, however they should be progressively lifted as the trade winds backs a little more into the north as they get closer to the coast. Today they were about 500 miles WNW of the Canary Islands. After tacking this morning their angle looked pretty horrible, pointing almost directly towards the islands, certainly south of east, but that has improved with speed today, making between nine and 10 knots. Their lead remains static at just over 900 miles - or three to four days - ahead of Neutrogena. The battle for second and third retains a frustrating status quo for Anna Corbella and Gérard Marin on GAES Centros Auditivos. They lost one mile to the leaders since the same time yesterday and three miles to Neutrogena. Each day in the northeasterly trade winds, 105 miles behind Neutrogena, GAES Centros Auditivos remains devoid of options. They can only follow the best course of the boat in front, still fighting for each metre. That does not stop Corbella from thinking of her first run on the Catalan beaches with her golden retriever while Marín will be eagerly anticipating being reunited with his daughter who was only four months old when he left on this three month race around the world. Pre-start they said they would be happy with a podium finish, but having been so close to Neutrogena - they will finish frustrated not to get close enough to have a go at passing in the Mediterranean. The three boats now in the North Atlantic were granted a brisk, business-like passage through the Doldrums, but that does not look likely for We Are Water and One Planet, One Ocean & Pharmaton. The band of calms and unsettled winds - 600 miles ahead - is widening all the time and it looks increasingly like it will slow this match race which this afternoon is just 30 miles apart. Aleix Gelabert on One Planet, One Ocean & Pharmaton reported:"At the moment we are in the tradewinds of the South Atlantic 15-17 knots, we are happy with this. I think We Are Water should be faster in all conditions, but if we have any opportunity with more wind, with 25 knots reaching is the only way that we have an opportunity to pass them. But if we have the same conditions again then maybe we will have an opportunity to pass them. "The conditions in the Doldrums will be a little bit difficult for us. I think that the three boats which have already passed had really good conditions. But for us and for We Are Water it looks really difficult, really tricky, really wide. And maybe we will spend three of four days getting out of there." High light of the day for the Renault Captur crew has been a shower and a shave, a tonic for their physical and mental fortitude given that they are close to the Uruguay and Brazilian coast trying to piece together a jigsaw of downwind and reaching lanes to get north while the route to the east is barred by the Saint Helena high. And Spirit of Hungary is making good speeds but start to have a high pressure ridge in front of them.